Quite possibly the best BMW 5 Series car ever, the BMW 535d offers the perfect blend of power, performance, economy and luxury to make it a great way to move about. Beautifully styled, the head-turning looks are full sport and majorly graceful. So why all the rave? BMW has the right mix in this one. You can’t call this the baby, neither can you call it overweight. Perfect lines give the BMW 535d a faultless platform to launch an assault on Audi, Mercedes, Jaguar, Lexus, Honda and Volvo equivalents. Matching the BMW 535d with the same level of detailing and quality is a very hard act to follow, indeed. Curvaceous lines incorporate a coupe-like roofline, which is always going to look good from any angle. The exterior lines have a forward momentum that finishes up sweeping over the bold kidney grille. A seam line runs the full length of the BMW 535d body and takes in the door handles along the way. It’s this attention to detail that makes this a real eye-catcher. It doesn’t finish there. 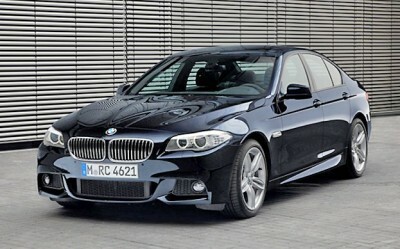 The BMW 535d is a complete car after all. When you sit inside the car’s exquisite interior, the seats are so comfortable, the materials breathtaking and the build quality faultless. Again the sense of elegance is felt. A flowing dash moves seamlessly from the instrument panel to the door. And, as soon as you sit yourself in the leather seats, all of the control elements are ergonomically positioned for a perfect fit. Look along the doors and the same smooth flowing lines are captured across the trim. Matching veneers, leather and floor coverings have been carefully sorted to provide gorgeous style, with a hint of flair. Now if the drive wasn’t great: you’d forget it! Not so with the BMW 535d. Featuring one of the best handling packages in its class, the BMW 535d has integral active steering, dynamic driving control, incredible damping control, adaptive drive modes and a chassis that adjusts to the pattern of the road. The double-arm front axle and the aluminium integral rear axle work to make a completely balanced, athletic and active driving experience. Power has to be class-leading too. With the BMW 535d, the moment you turn the key, you know there is something special about to happen. A quiet engine with instant response equates to a silent drive with thrilling acceleration. Smooth progressive acceleration is immense when the accelerator is firmly planted. An eight-speed automatic gearbox knows exactly which gear to be in and what it needs to do. Straight-six, turbo-diesel power packs a rival-crippling 230 kW of peak power and 630 Nm of torque. Remarkably, the BMW 535d has a combined fuel consumption figure of below 6 litres/100 km. BMW 535d safety features are the best available. Active headrests reduce whiplash in the event of a collision. Active Protection initiates protective measures for the vehicle occupants in the event of an imminent accident. Driver and front passenger airbags, a seat occupancy detector for the front passenger airbag, head airbags in the front and rear, and, side airbags for driver and front passenger, and a crash sensor give you an idea that you’re comprehensively covered in a 535d. DSC, BA, DTC, CBC and ABS are standard active safety features for all BMW 5 Series models. So, do you like the way you move? If you want a class act, then the BMW 535d is just that! For any more information on the BMW 535d or, for that matter, any other new car, contact one of our friendly consultants on 1300 303 181. If you’d like some fleet discount pricing (yes even for private buyers! ), we can submit vehicle quote requests out to our national network of BMW dealers and come back with pricing within 24 hours. Private Fleet – car buying made easy!